Wallet Generator tool is a universal open source client side wallet generator that encourages users to download the tool from Github to use offline. This ensures the private key that is generated is only ever displayed on your PC and is never accessed by the website or any third party entities. After downloading the website, disconnecting from the internet and opening the index.html file on your computer, you will then generate your address using your mouse to highlight random text and numbers. After your wallet has been generated you can simply print the Paper wallet version and store this safely away for later use. 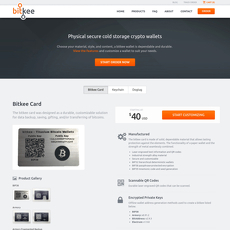 The site generates a very nice graphical display of the wallet and even provides folding instructions. The site includes tool to create a single wallet, paper wallet, bulk wallet, brain wallet, and of course includes a wallet detail checker. The wallet detail checker allows users to enter their wallets addresses to view their contents. 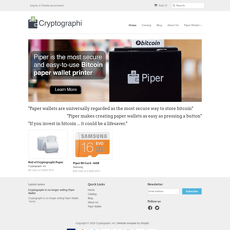 The website also includes a handy “frequently asked questions” section detailing a plethora of information regarding the safety and usage of a paper wallet. This site is very handy and incredibly easy to use. It supports several different cryptocurrencies and since it is open source, users can add to the project support for new cryptocurrencies. Wallet Generator even supports wallet creation for several testnet applications! 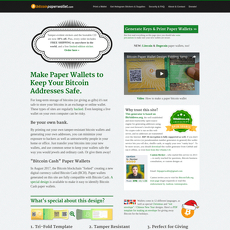 Easy to use and generate paper wallets. Contains the same idea and tools as most other paper wallet websites.